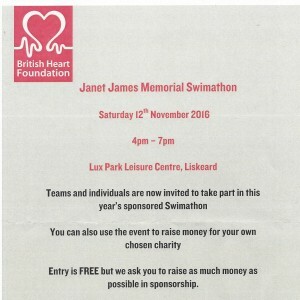 Take part as an individual swimmer or as a team (approx 5 people). Open to all ages, you just need to be able to swim a length of the pool (25 metres). Each individual team will be allocated a 30 minute swimming slot with teams swimming in a relay manner, commencing at 4.05pm, 4.40pm, 5.15pm, 5.50pm or 6.25pm. Entry is free but we ask you to raise as much as possible in sponsorship. 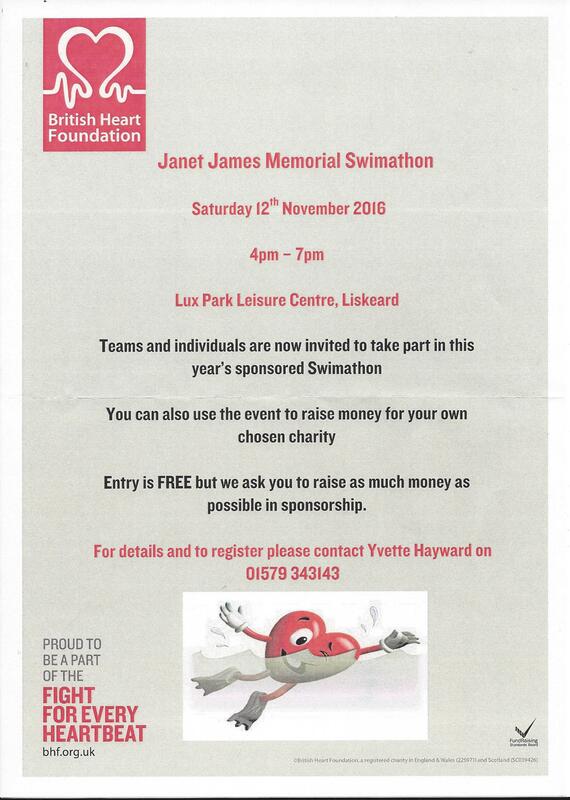 Should you wish to use the event to support another charity then your sponsorship may be split, with 40% going to your chosen club or charity and the remaining 60% to the Liskeard branch of the British Heart Foundation who are organising the event. All participants will receive a certificate, and trophies will be awarded for special performances.